If you like to shop but don't like to add to the plastic or paper bag havoc, then you probably love your material shopping bags you can use over and over. This bag is a great bag for all your shopping needs. It also makes a great way to get your business name out there with customers. This bag is great for putting your goodies in. This bag is made of 100% PET recycled material. Which is great for the eco-friendly people. There is one large compartment and one front smaller zippered compartment There are woven dual carrying handles. 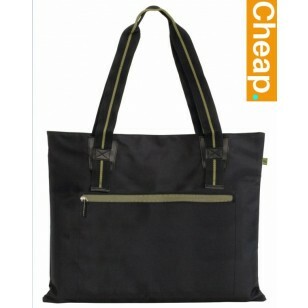 There is only one colour choice, the main bag body is black, the zippers and a stripe on the handles are an olive green. You will love this bag and how durable it is and comfortable it is to carry. Summary of Features Material is 100% PET recycled material sourced from recycled bottles. This bag only comes in one colour scheme, it is all black, with olive green zippers and olive green stripe on handles.